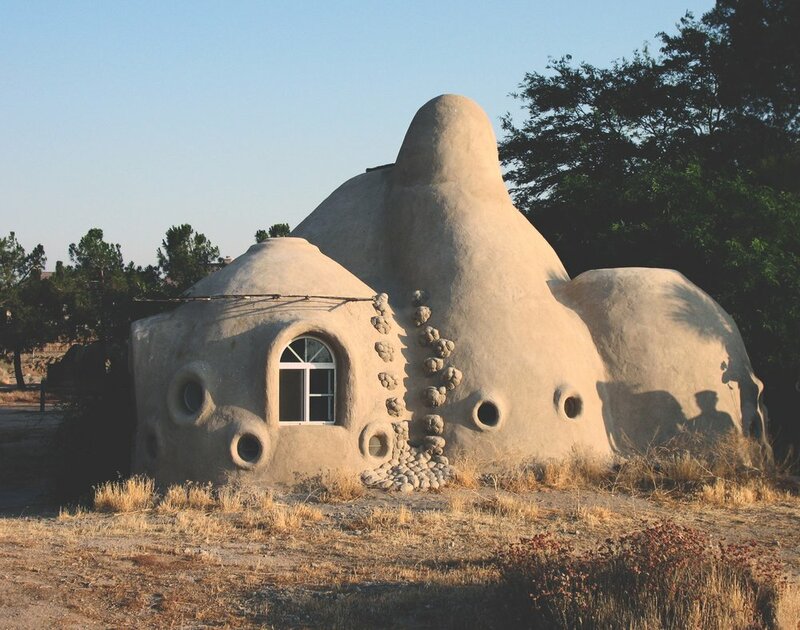 SuperAdobe is a form of earth bag architecture developed by architect and CalEarth founder Nader Khalili. Using long sandbags ("SuperAdobe Bags"), barbed wire, on-site earth and a few tools, Khalili devised a revolutionary building system that integrates traditional earth architecture with contemporary global safety requirements, and passes severe earthquake code tests in California. The building process is intentionally simple, but the structural integrity of SuperAdobe is the result of years of research. The structural design uses modern engineering concepts like base-isolation and post-tensioning. The long coils of sandbag provide compression (vertical) strength. While the barbed wire adds tensile (horizontal) strength. In addition, the sandbags add flood resistance. The earth itself provides insulation and fire-proofing. Cal-Earth believes that the whole family should be able to build together, men and women, from grandma to the youngest child. We have spent many years researching how to make the process simpler and easier. There should be no heavy lifting or backaches, no expensive equipment, and a flexible and fast construction. The bags are filled in place on the wall using small pots like coffee cans, or even kitchen utensils. You can build alone or as a group. The arch is the strongest form in architecture and has been used in building for thousands of years. A dome is simply an arch rotated 180 degrees. SuperAdobe is extremely well-suited for building arches, domes and vaults, and SuperAdobe domes are extremely strong structures. They have passed California earthquake code tests, and withstood a 7.6 magnitude earthquake in Nepal. Using geometry and a simple compass tool, builders can easily create corbelled dome structures of various heights and up to 22 feet in diameter. All SuperAdobe structures can last several years but to make a structure permanent, the builder must plaster over the sandbag structure. This protects from erosion due to water and weather. Plastering also provides an aesthetically pleasing finish that can be painted or left its natural color. Learn how to build with SuperAdobe online or at our campus in Hesperia, California! Architect Nader Khalili is the inventor of SuperAdobe and the founder of CalEarth.